Completed after seller tore down the previous record breaking mansion of its time that had been owned by Wayne Huizenga, this home was designed by world renowned architect Jeffrey Smith of Smith Architectural Group. 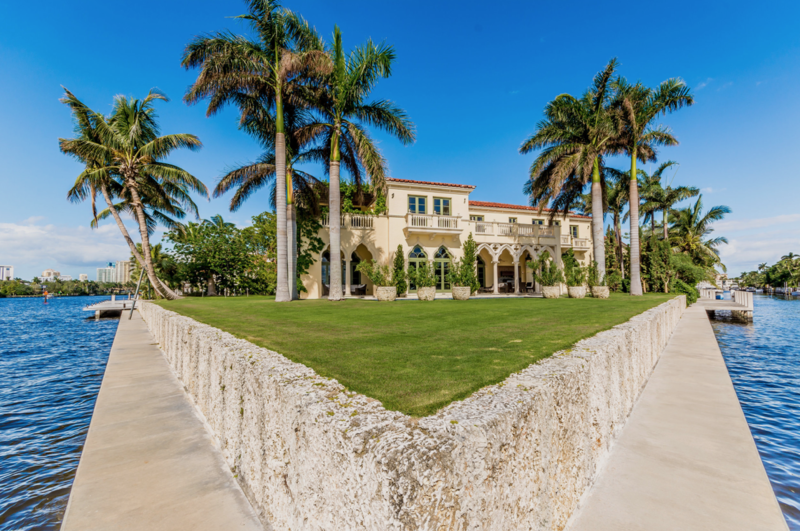 Exhibiting Palm Beach inspired classical Venetian architectural style on an elevated private one acre peninsula and 750 ft of waterfront, this 17,500-square foot majestic work of art rests over gorgeous aesthetic appeal. This five ensuite eleven bath estate features magnificent marble and intricate craftsmanship throughout, artistic loggias, custom lighting, intricate decorative touches including stunning chandeliers, a unique chef’s kitchen, divine built-ins, gym, massage room, 1780 sq ft yoga/meditation room, panic room, a grand sweeping staircase leading to a sprawling second floor, a Venetian pool, a four car garage and much more. This is the only starchitect Jeffrey Smith and famed interior decorator Bunny Williams of NY home in the Yachting Capital of the World. The interior faux art was hand painted by the now late great Leonard Pardon whose work can be found in Buckingham Palace, Windsor Castle, and the Palaces in the Sultinates of Oman and Brunei. 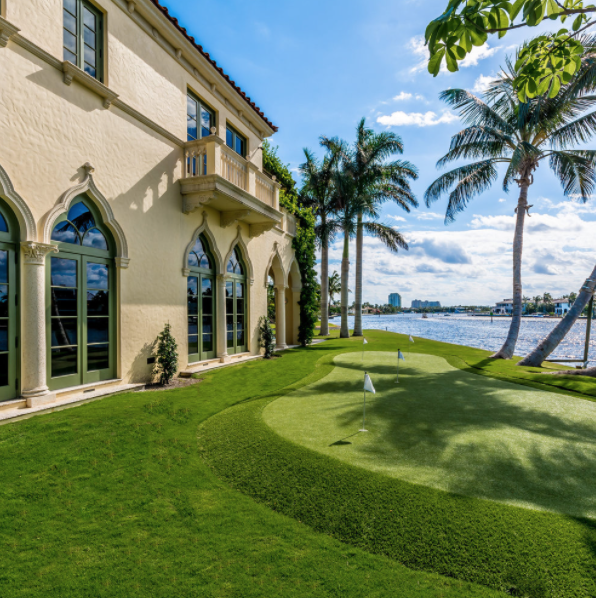 Casa Bella Fortuna has won several awards, including the Institute of Classical Architecture & Art (ICAA) Addison Mizner Award for Craftsmanship, 10 CASF Awards for craftsmanships, and FNGLA Award for outstanding landscaping. 11 bathrooms (plans for 2 more) – 17,352 approx. sq. 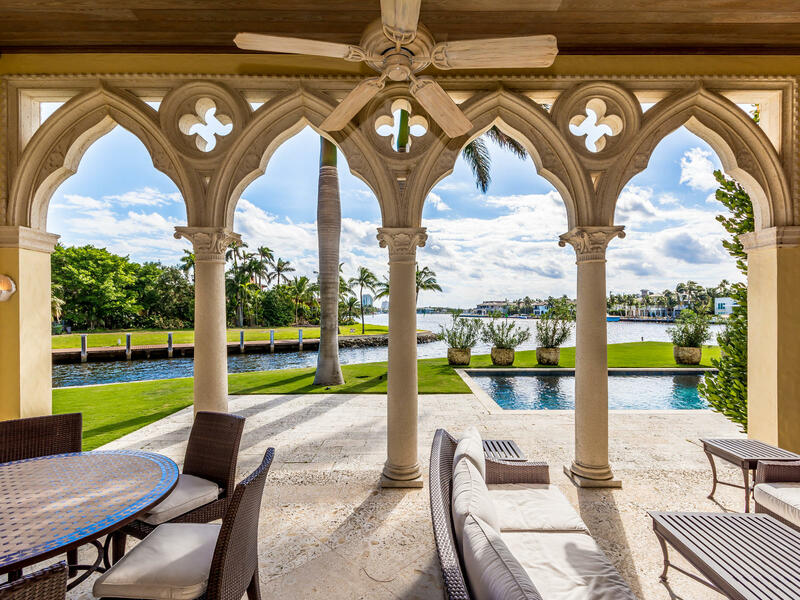 ft.
Award Winning Trophy Estate inspired by Doge’s Palace in Venice on a rare waterfront Peninsula (double point lot) in Fort Lauderdale. This work of art is the only home designed by famous and renowned architect Jeffrey Smith of Smith Architectural Group in Fort Lauderdale. This brand new construction of classical venetian architecture has more then 750 ft of waterfront, coincidentally in the City known as the Venice of America (aka: Yachting capital of the world). Recipient of over 12 awards including the prestigious the Institute of Classical Architecture & Art (ICAA) Addison Mizner Award for Craftsmanship” for Classical Architecture along with 10 awards from the CASF Craftsman Association of South Florida and award from FNGLA for outstanding landscaping.